The challenge at ColourQ this week is to CASE a ColourQueen. 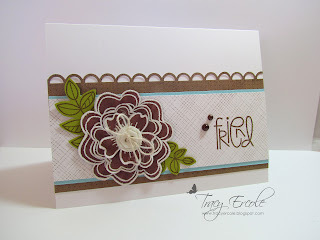 I chose to CASE Jen Mitchell's card, the ColourQueen from challenge 98. I love this card and hope I did it justice. gorgeous!! i almost chose this one to CASE also!! so glad you joined us this week att he ColourQ!! Absolutely GORGEOUS!! I would say you have done great justice to the original card - "Jen" will be much impressed! You did it justice! This is amazing. Love that flower. Beautiful card, Tracy! I love your CASE of Jens card. 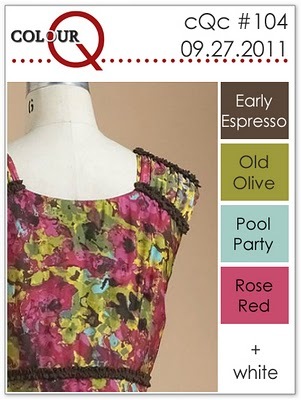 Thanks for joining us for the two year anniversary at the ColourQ. What a difference it made making it horizontal. Great job and love the flower.